Fortune is the newest entry in the Fast Forward series from Stronghold Games. 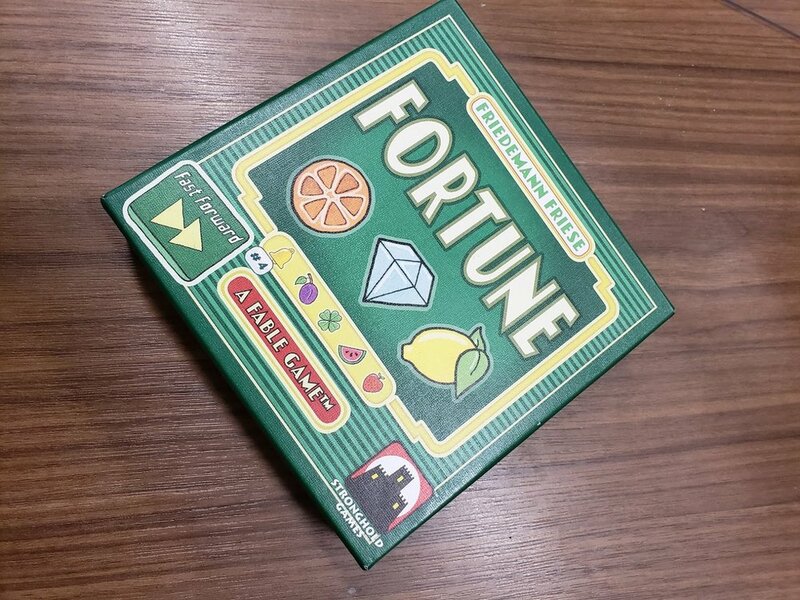 In Fortune, like the other games in the Fast Forward series, the rules are broken into very small chunks so the players can more easily learn as they play through the deck their first time. 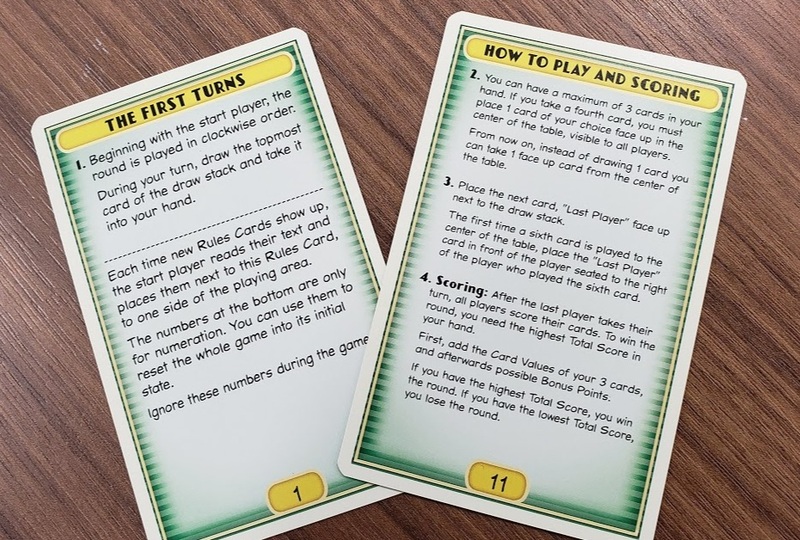 The complete lack of a ponderous tome of rules to be read before starting the game is a huge advantage - play begins by reading the starting rules on the first card on top of the deck and following the instructions. Players don’t even know what maximum hand size is or how to win until they are eleven cards into the deck. As players draw cards new rules surface and are incorporated into the game, either adding to the game or replacing previous rules. Card 1 starts the game, and the next rules show up after several cards have been drawn by all the players, just as they start wondering what they are trying to accomplish. On their turn, players each draw a card from either the deck, or the discard pool. Then, if they have more than three cards, they either discard a card, or if they have a card with a special action they want to use play the action card in front of them. Once six cards are discarded the final round is triggered, and scoring happens quickly thereafter. However in Fortune the goals and scoring can change; in one hand players may be playing a variant where they compete to get the highest score while in another they may be trying to get the lowest value or gather a specific kind of card for a really huge score. Fortune has all kinds of cards. Cards with numbers, cards with special actions, rules, cards, and cards that change the way a player’s cards are scored. Play changes as rules change and cards are removed from the top of the deck between rounds, so what worked last round may not work again. New cards add a variety of special abilities that either have an immediate impact when played during the game or may remain hidden in their hands until revealed during scoring. One set of cards may provide a score of over 100, but if you change just one card your hand may have a negative value. That kind of swing may be a good or a bad thing, if the way cards are scored changes when a new rule is flipped. Once the deck has been played through it can be resorted by number, to provide a fresh discovery experience to new players, or the base rules can be set aside while all the other cards are just shuffled together and played as a complete game with some rules changing over time. For more intense competition players can track wins over multiple games, with a natural stopping point being the depletion of the deck. Fortune, of all the Fast Forward games, feels like there is a lot that could be done to expand the game play. More goals and rules, more cards with special powers, and greater use of the existing iconography. It is easy to imagine another Fortune game of a similar level of complexity that could be shuffled into this deck to provide a richer game experience. The particular genius of the Fast Forward Series is how approachable it is. Though die-hard gamers are likely to find Fortune a little lite, especially at the start of the deck, it really is an amazing game for a public library or even in classrooms where quick games are needed or basic math skills are being reinforced. The changing rules help familiarize players with dealing with a changing environment while the sense of discovery keeps Fortune interesting over time. Posted on December 18, 2018 by Stephanie Frey and filed under Self Teaching Games and tagged Self Teaching Games Fast Forward Computational Thinking Card Game Stronghold. Fear is the first entry in the Fast Forward series from Stronghold Games, where players learn the game as they play it for the first time. One of the key selling points is that the game has no rulebook. Instead players begin with a deck of cards with the starting rules on the first card. Players draw cards to begin playing the game; as they work their way through the deck, new rules cards surface so players learn the relevant section as they play. On their turn, players each draw a card and play a card from their hand. The goal is to force other players to push the total value of the cards in play over 15, all without doing so themselves. The hands end when someone raises the value over 15, and the person who causes the pile of cards to exceed 15, but the person who has the highest value in their hand wins. Play changes as cards are removed from the deck and rules evolve as players dig deeper in and new cards are added to the mix. The core mechanism is simple, with interesting decisions from both designers and players, all of which add both to the dynamic of gameplay and the sense of the discovery. Conflict is indirect; instead of simply attacking each other, players try to arrange things so that their opponents are forced into making the critical error that ends the hand. As players become familiar with both each other and the ever-evolving rules sets, the game gets more difficult: the same strategy rarely works twice, and any stunt you pull might well inspire an opponent in the next game. Fear is perfect for just about any public facing collection. It’s a devilishly basic game that works well as an alternative to traditional games like Uno, Crazy 8s, Skip-Bo, and Spite & Malice. It works equally well for circulation or in-house collections. Fortress, the second in the Fast Forward series, is a bluffing game. Unlike Fear, the first entry in the series, Fortress focuses on direct conflict as players try to conquer the titular fortresses using sets of monsters they gather to increase their combat strength. The number you play of a given type of monster increases their effectiveness when taking over or defending a fortress. Over multiple plays, the variety of monsters available change, and the number of fortresses expand, as do the rules pertaining to them. Play starts with all the core rules on the front and back of a single card. New rules emerge from the deck over multiple rounds, called “hands.” Re-sorting the deck once players have completed all the rounds isn’t a hassle, but it also isn’t necessary. Once players have played through the whole deck, they can either re-sort the game and play through it from phase one, or shuffle all of the non-rules cards and play with all of the rules available from the start of the new game. In all, Fortress is a perfect library game. It has enough depth to have interesting decisions for a wide range of game skills, while the conflict of attacking fortresses owned by other players will be exciting for kids raised on video games. Players who like traditional games like War, Old Maid, Battleship, Risk, or Stratego will find Fortress right up their alley. Flee is the third and (to date) final Fast Forward game. Like Fear and Fortress, Flee’s first cards instruct players on how to start the game, with new rules being revealed on other cards over the course of play. If you’ve been following our takes on this series, this should sound familiar, but don’t get too comfortable. Where the other Fast Forward games are competitive, Flee is a puzzle that players must cooperate to solve. Because Flee is cooperative, the cards players gather are played face-up where everyone can see them, becoming actions they can utilize and pass off or discard over the course of the game, with a certain amount of collective commentary and strategizing. Flee is a tense and exciting drama that that builds teamwork and critical thinking skills as players stave off inevitable defeat long enough to learn what they will need to do to get further on their next play through. Flee, unlike Fear and Fortress, is not suitable for just any game collection. It stands out as a difficult problem to solve, making it appealing to fans of logic puzzles but less so to casual gamers. We liked Flee, and played multiple sessions of it, but never actually completed the game by making it through the deck and defeating the required number of monsters. It’s a good capstone to Fear and Fortress, but don’t expect heavy circulation if you stock it. Posted on October 29, 2018 by Stephanie Frey and filed under Self Teaching Games and tagged Self Teaching Games Fast Forward Computational Thinking Card Game Stronghold. One of the most difficult aspects of incorporating activities with a high cognitive load, like games, into a school or library program is managing multiple activity streams and instructing diverse groups in how to play a variety of titles. Not knowing how to play a game is always a barrier, but it’s significantly tougher for potential players unaccustomed to internalizing new and complex rules structures. Fortunately there is a new trend in tabletop games, one that video games adopted years ago: have the game itself teach players how to play - without needing to wade through an impenetrable rules book. That impenetrability raises a further question: why are most rules books so horrible? The reasons range from poor visual presentation to simply overwhelming new players with irrelevant information. A set of rules that effectively teaches players how to play a game is a different beast than one that acts as a good reference guide once players already know the the structure of the game. Game companies have tried a variety of ways to sidestep these issues. Some games have introductory scenarios while others include long narrative examples to provide more context than players would get out of a bullet point. It’s also become common to find “How to Play” videos on YouTube in an attempt to mitigate the difficulty of thickly written or poorly designed rulesets. If a game can’t be taught effectively straight out of the box, there are options. But having to take that extra step just to learn how to play isn’t exactly a good thing. With games like those in the Fast Forward series, Stronghold Games has embraced the idea of teaching the game as it’s being played. The three games of the Fast Forward series - Fear, Fortress, and Flee - have no ponderous tome of rules. Instead players start with a deck of cards, and the starting rules are right on the first card. Players draw cards to begin playing the game, and as they work their way through the deck new rules cards surface so players learn the relevant sections as they play. The Fast Forward system is an elegant framework allowing players to explore a growing gamescape. The sense of discovery is intense and exciting, despite the small steps players take towards learning how to play the complete game. Fear, Flee, and Fortress are each amazing because at the end of the experience, players can either rebuild the starting deck so they can be played again from scratch, or the rules cards can be kept out and the cards can be shuffled so the games can be played in their final, completed form. While this system of game instruction is ideal for games with relatively simple rules that can scale and evolve, that isn’t the only place where this structure would work. Hush Hush Projects’ Fog of Love is a rich game with a much more complex set of interactions, and their tutorial system steps players through their first play of the game with named and numbered cards integrated into numerous decks. Besides the significant difference in complexity and subject matter, Fog of Love also has well structured rules that exist less to teach players how to play the game, and more to act as a reference to answer questions that pop up during play or in future sessions of the game. Not all games need to inflict a significant learning curve on players. Even richly detailed games which have a fully functional rulebook, like Fog of Love, can still walk players through an engaging learning experience while shorter games that need repeat plays to experience seem ideally made for this format. Self teaching games also support computational learning activities by serving as an example for how to chunk instructions by breaking up information and providing them as needed instead of all at once. This has really served as an inspiration for how we manage game design classes; our young game designers write their rules on note cards so they can better examine how to organize and present them during play. Not only can self teaching games like these help reduce the load on staff during high traffic game days, but the sense of exploration through play is intoxicating. It’s a joy of discovery: the playing field is leveled between the people who would normally be running the game and the people who play it, preventing any one personality from dominating the group and allowing everyone to bring their own ideas and interpretations into play. That same element of discovery encourages a level of collaboration often missing from games that give away all the rules up front. The rest of this series will have in-depth reviews of the games mentioned here, as well as The Cloud Dungeon, and other self teaching games as they become available. Posted on October 22, 2018 by Stephanie Frey and filed under Self Teaching Games and tagged Self Teaching Games Fast Forward Computational Thinking Card Game Stronghold Fog of Love.